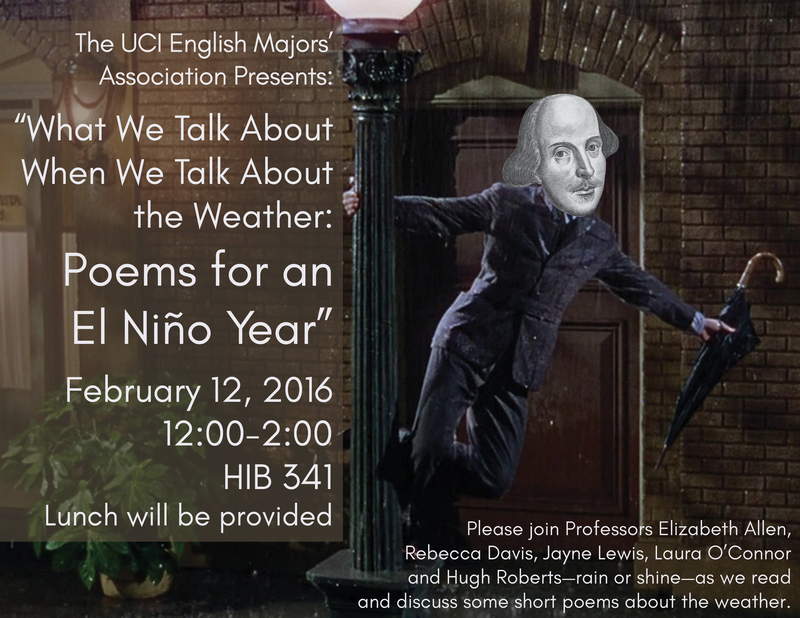 “What We Talk About When We Talk About The Weather: Poems for an El Niño Year” Friday, Feb 12th 12:00-2:00pm in HIB 341. All undergraduate students are invited to join Professors Elizabeth Allen, Rebecca Davis, Jayne Lewis, Laura O’Connor and Hugh Roberts to read and discuss some short poems about weather and weather-related matters. You can download the poems at this link (coming soon! ), but the poems are short and everyone will be able to participate fully whether or not they’ve read the material beforehand. Lunch will be provided. Feel free to bring friends. Alumni welcome! 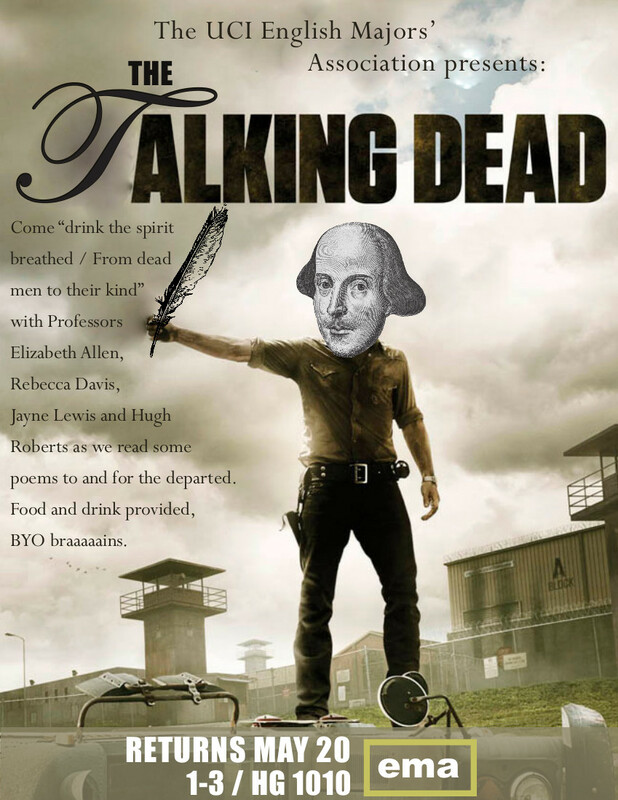 You can download the poems we’ll be discussing at this link. 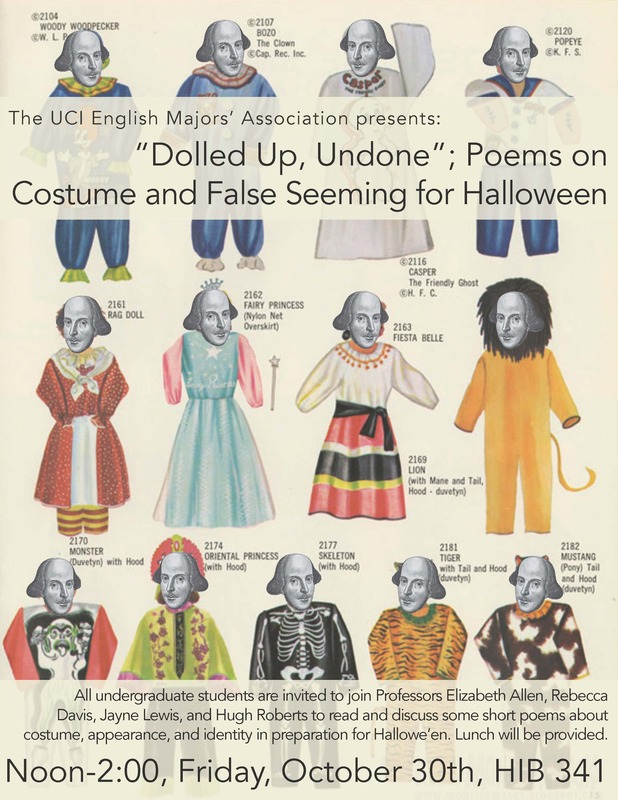 All undergraduate students are invited to join Professors Elizabeth Allen, Rebecca Davis, Jayne Lewis and Hugh Roberts to read and discuss some short poems on the theme of costume, appearance and identity in preparation for Halloween. You can download the poems at this link, but everyone is welcome to participate whether or not they’ve read the material beforehand. Lunch will be provided. Feel free to bring friends. Alumni welcome! 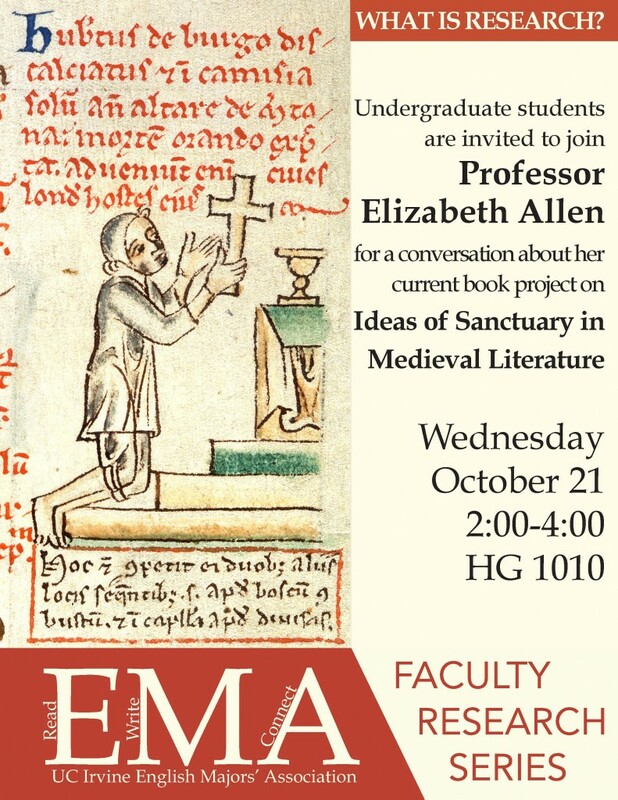 All English and Literary Journalism undergraduate students are invited to join Professor Elizabeth Allen in a discussion about the nature of academic research in English with particular reference to her research for her upcoming book on the idea of sanctuary in Medieval literature. 2:00-4:00pm Wednesday, October 21 in HG 1010. Please join Professors Elizabeth Allen, Rebecca Davis, Jayne Lewis and Hugh Roberts on Wednesday May 20th at 1:00pm to read and discuss six poems written to or for the dear departed. Click here for a copy of the poems that you can print out and bring along. Lunch will be served. You are welcome to come late and/or leave early if you need to. Have you thought about going on to graduate study in English? The English Majors’ Association is excited to announce our upcoming event, an advising session for all students interested in that possibility. 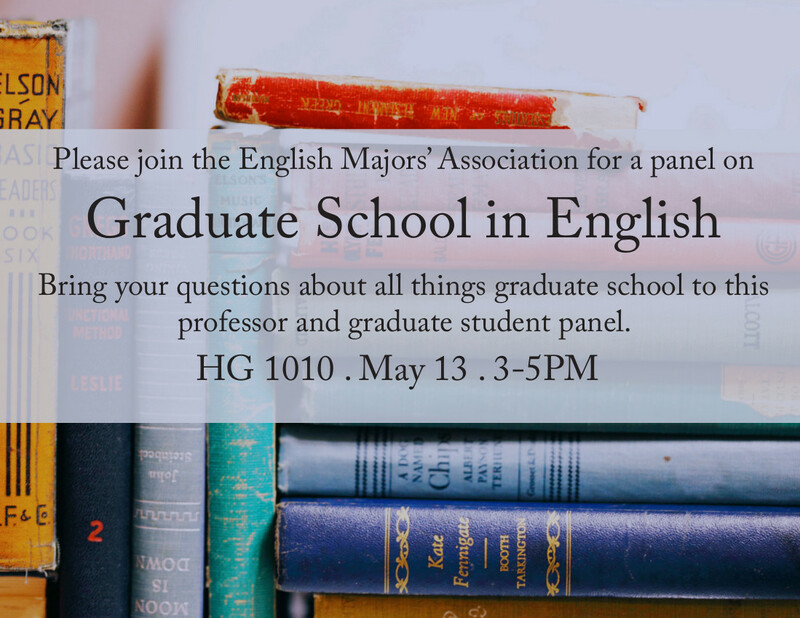 The Graduate School Advising Panel, will meet from 3-5pm in HG 1010 on Wednesday May 13. There, professors Julia Lupton and Jerry Lee, along with current graduate student Anna Finn, will be holding an open panel to answer the questions of undergraduate students interested in graduate study. Some of the questions and topics that will be discussed include: the process of enrolling and attending graduate school, what to look for in graduate programs, how does graduate work differ from undergraduate work, and why one should go (or should not) to graduate school. You can ask any questions you have at the event, or, if you can’t make it, send them to us at englishmajorsassociation@uci.edu and we’ll ask them for you. A summarized question and answer sheet, will be made available afterwards, on request, so please do send in your questions even if you can’t attend! Update: Recordings of the session (in three parts) are available. The quality is not great, so be prepared to adjust your volume control as needed. All English Department majors are invited to join Professors Elizabeth Allen, Jayne Lewis and Hugh Roberts to read and discuss six short poems of heartache, lost love and spite in preparation for Valentine’s Day. Click here for a copy of the poems you can print out and bring along.